After a 3-month hiatus due to a day job project that kept me way too busy, I’m happy to be able to get back to doing new posts for the MensPulpMags.com site. I didn’t entirely neglect the realm of men’s adventure magazines during that time. Recently, my multitalented publishing partner Wyatt Doyle and I created and released another book in our Men’s Adventure Library series. It’s titled BARBARIANS ON BIKES: BIKERS & MOTORCYCLE GANGS IN MEN’S PULP ADVENTURE MAGAZINES. The “Barbarians on Bikes” part of the title comes from a historically-significant story about the Hells Angels published by the men’s adventure magazine TRUE in August 1965. Previous books in our Men’s Adventure Library series are illustrated story anthologies. 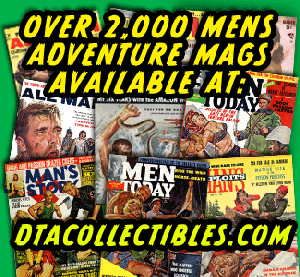 They collect classic men’s adventure magazine stories along with the original artwork and photos that went with them. BARBARIANS ON BIKES is a new type of book for us. 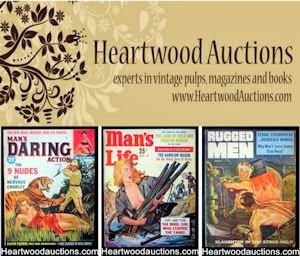 It’s all artwork and photographs; a full-color, large-format (8.5” x 11”) visual archive of men’s adventure magazine covers, interior artwork and photos. Some of the actual 2-page spreads from the book are shown in this post. It’s now available on Amazon worldwide. The Amazon listing for BARBARIANS ON BIKES has an extensive “Look Inside” preview. You can see an even longer preview on the Issuu.com website. There are two editions: a 116-PAGE trade paperback and a special 136-page deluxe hardcover that includes 16 pages of additional content. Most of the images in the book feature members of the Hells Angels-style motorcycle clubs (a.k.a. gangs) that became increasingly popular as the bad guys in men’s pulp mag stories in the 1960s and 1970s. Others examples feature good guys on bikes, sometimes fighting the best-known men’s adventure villains – Nazis. Many people think Nazis are the most common villains in men’s pulp adventure magazines. I suspect that’s because the lurid covers showing sadistic Nazis doing terrible things to half-naked women are the ones that seem to get the most attention and the most reposts on the Internet. It’s true that scantily-clad women were one of the most common elements of men’s adventure magazine stories and illustrations. They were men’s magazines, after all. But the iconic sadistic Nazi covers and stories were primarily featured by the low-budget “sweat mag” subgenre of the broader men’s adventure (MAM) genre. 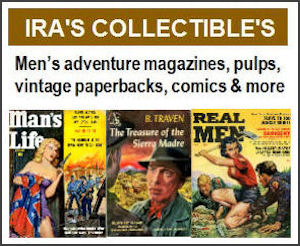 That genre includes a handful of top tier, high circulation periodicals like ARGOSY and TRUE, scores of classic mid-tier men’s adventure mags, like those published by Magazine Management (ACTION FOR MEN, FOR MEN ONLY, MALE, MEN, STAG, etc. 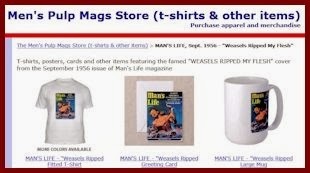 ), and dozens of low-budget “sweat mags” published by companies like Reese and EmTee (MAN’S BOOK, MAN’S STORY, MEN TODAY, NEW MAN, WORLD OF MEN, etc.). About 160 or so different titles that can be classified as men’s adventure magazines were published in the 1950s, 1960s and 1970s. Some lasted for years. The most popular titles ran through all three decades. But many were short-lived, lasting for one to 10 issues. 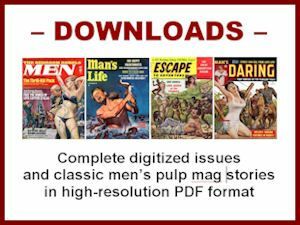 The stories, covers and interior artwork in the more than 6,000 men’s adventure magazines issues that were published feature a far wider range of bad guys than just Nazis. If you look for those that span all three tiers of the men’s adventure genre, bikers are at the top of the list. In fact, along with the biker movies that became popular in the 1960s and 1970s, men’s adventure magazines played a key role in creating the popular image of motorcycle gangs in American culture. That’s the fancy name Wyatt gave to my collection of men’s adventure magazines, which now totals over 5,000 issues. Most of the covers, interior spreads and photos in BARBARIANS ON BIKES have never been reprinted in any books since their original publication. Many of the illustrations were done by some of the greatest mid-20th Century illustration artists whose work appeared in men’s adventure magazines, such Mort Kunstler, Charles Copeland, Norm Eastman, Bruce Minney, Basil Gogos, Samson Pollen, Gil Cohen, Al Rossi, John Duillo and Earl Norem. My colleague Wyatt designed the book, as he did our previous volumes. I think Wyatt’s layout for BARBARIANS ON BIKES is particularly outstanding. And, the large format gave him a lot more room to play with. Wyatt also wrote an insightful introduction for the book that reflects his in-depth knowledge of both MAMs and vintage exploitation films. It connects some of the dots between the real history of motorcycle gangs, their portrayal in men’s adventure magazines and biker movies of the ‘60s and ‘70s. Another special feature of the book is an Afterword written by our friend Paul Bishop. Paul is a veteran Los Angeles police detective who became a popular and prolific crime fiction and “new pulp” novelist. (His latest novel is LIE CATCHERS.) He’s also an indie publisher of novels by many other talented new pulp authors, a screenwriter, a widely-followed blogger and an expert on modern pulp fiction in general and mid-20th century men’s adventure paperbacks in particular. During his 35 years as a cop, Paul got to know a lot about the Hells Angels and other biker clubs. His Afterword is a gripping account of some of the things he learned. I’ll feature more scans from BARBARIANS ON BIKES and post some excerpts from Wyatt’s introduction and Paul’s Afterword in future posts here. In the meantime, if you want head out on the highway with your own copy of the book, you can click on this link or the image below to buy one on Amazon. You can also buy a signed copy from me on eBay.